Groundbreaking collaboration between Gray Fish Tag Research and Mexican Marine Research Center [CICIMAR]. Los Cabo (Cabo San Lucas) is one of the top fishing destinations in the world. There are a multitude of fish species that anglers can target, from Blue Marlin, Striped Marlin, Yellowfin Tuna, Dolphinfish, Roosterfish, etc. For such an amazing fishery, surprisingly there is not much known about many of the fish in that region. In an effort to learn more about the incredible Cabo San Lucas, MX, fishery, the Gray FishTag Research team accompanied by writer and photojournalist Gary Graham, Rogelio Gonzalez Armas, Ph.D., from Centro Interdisciplinario de Ciencias Marinas, Dave Bulthuis from Costa, and Tracy Ehrenberg from Pisces Group Cabo, set out on the water with the goal of deploying two MiniPAT satellite tags on Striped Marlin (Kajikia audax). 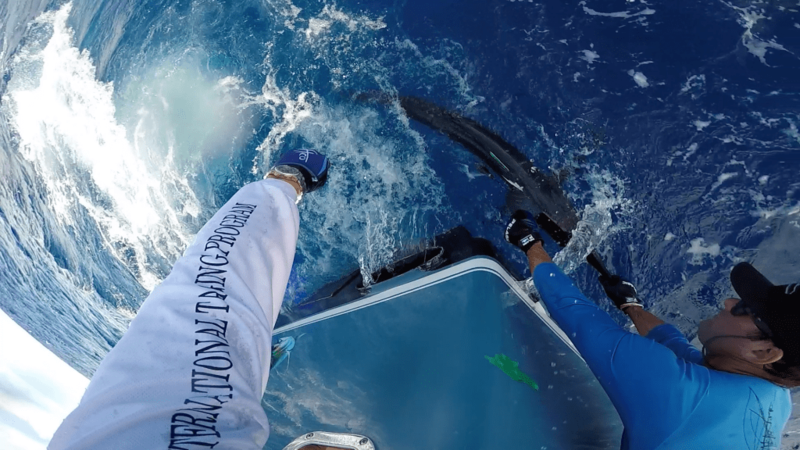 After a 52 mile run aboard the beautiful 62’ Viking Sport fisherman named “Tag Team”, we arrived at a spot where the Striped Marlin bite had recently been great. Within 2 hours of fishing we had hooked with 2 Striped Marlin and successfully deployed the satellite tags. Dave Bulthuis was the angler who reeled in both fish. 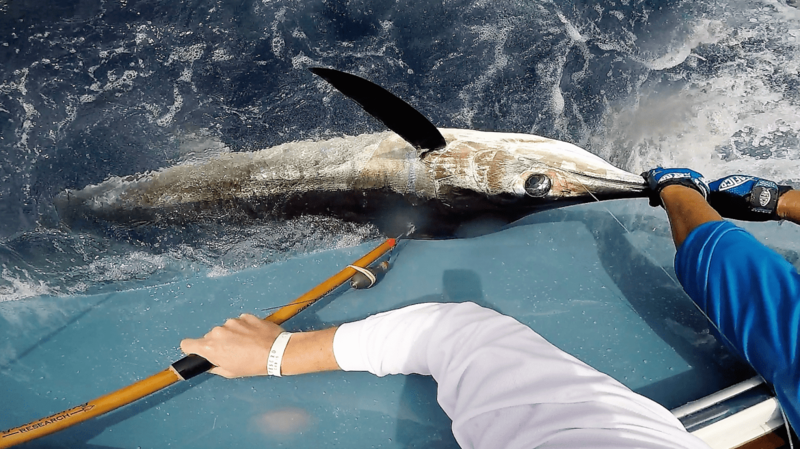 The first marlin was named “Bill Gray” in honor of the founder of Gray Taxidermy and the second marlin was named “Tracy” after founder of Pisces Group Cabo. Those 2 satellite tags are the first pop-off satellite archival tags deployed on Striped Marlin in the Baja region. They will record data on light level, water temperature, water depth for 365 days. The information gained from the tags will provided scientist and anglers with the knowledge to sustainably fish for Striped Marlin for many years to come. A special thank you to; Wildlife Computers who provided the two MiniPAT tags as part of new tag design testing. A big thank you to Pisces Group Cabo who arranged the charter boat and fuel for the expedition. Travel and logistics was provided by Gray Taxidermy.